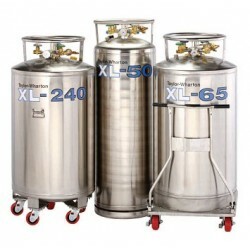 Pressurised Vessels There are 3 products. 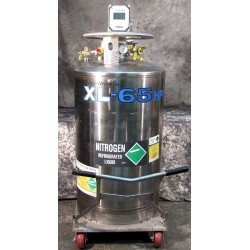 High pressure use and for gas and liquid withdrawal.. Liquefied or gaseous nitrogen, oxygen, argon, carbon dioxide, nitrous oxide XL-50HP XL-65HP These high pressure units are equipped with automatic pressure building and economizer circuits, as well as an internal vaporizer, making them ideal for handling a variety of gases or liquefied agents. 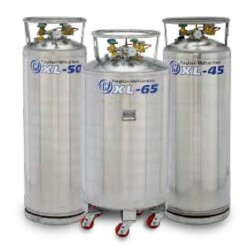 The XL Series are vessels designed for low pressure use and for liquid withdrawal. The XL-100, XL-160 and XL-180 are transportable units built to rugged construction standards. They are specifically designed for the low pressure requirements of liquid nitrogen filling, storing and dispensing and feature easy, quick liquid withdrawal. The GL Series are vessels designed for medium pressure use and for gas and liquid withdrawal. These over-the-road transport cylinders feature automatic pressure-building and economizer circuits. Low-loss holding capabilities help conserve gas during low demand periods. These units are considered the workhorses of the industry.